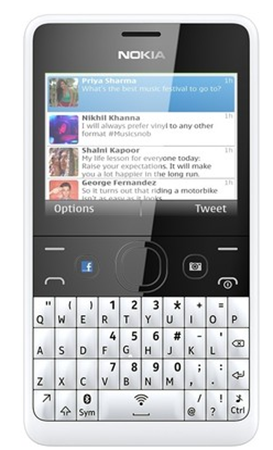 The Nokia Asha 210 is a low cost device recently launched by Nokia in the Indian market. The phone comes with a high value for money, priced at only 4,499 INR which makes it fairly affordable. The phone comes in two variants; dual and single SIM. The dual SIM variant comes with a dedicated button for Facebook whereas the single SIM version sports a dedicated button for WhatApp. The device does sound exciting for people not looking for an Android/Windows Phone device, and cost effective at the same time. The phone comes with rather mediocre specifications, given the intended usage. The phone packs only a 2MP camera which does sound like a thing of the past, but given the price point and Nokia build quality, we’d take it. A 5MP camera would have made things sound much better, but nevertheless. Apart from the 2MP camera, another thing you might find sub-par is the internal storage. At just 64MB, it sounds like a mere formality. However, microSD cards of up to 32GB are supported, which means that there will be no shortage of storage given that you don’t mind purchasing a microSD card. Low internal storage is a problem faced by most/many users, we wonder how long it will take for manufacturers to realize this. Even MediaTek are known to ship devices with very low (~4GB) internal storage. Battery has always been one forte for Nokia which it has ruled. Not as much with the processor, but they are usually at par. There is no word on what processor this phone uses, all we know is that it comes with 32MB of RAM, so we expect the processor to be a single core 500-800MHz unit. The phone comes with the same battery we saw in the Nokia Asha 501, which uses a 1200mAh BL-4U unit, which Nokia uses in a variety of devices. This means that finding a replacement won’t be tough either. Nokia promise a talktime of up to 12 hours on a single charge, which does sound like a boon in this age of Android phones which have an average battery life of 3-5hrs with talktime. The phone packs a rather small display of 2.4 inches. Those used to big-screen Android phones might require some time to get used to this phone’s screen. The 2.4 inch display packs a QVGA resolution of 320×240, which should prove to be decent enough given the category the phone falls in. Users would not be expecting great media playback on this device, since it is not meant for it. The overall hardware components do complement each other, a 2.4 inch screen with 2MP camera and physical keyboard does make sense. The display will be of TFT type, which should pack decent pictures and UI should look smooth and fluid. Unless you’re looking for a multimedia device, the Asha 210 should do good. The Asha 210 looks like a great device with decent specs. Although there is not much to speak of in terms of hardware and specs, whatever is actually there, does it’s job. We expect the Asha 210 to be a high-selling phone this year, given the price point and the reliability which Nokia has in this country. With great battery life as an added advantage, many people would want the Asha 210 as their secondary phone, which might also prove to be more robust than their Android/Windows phone. At 4,499, the device can be bought from Flipkart. Are you sure that the ROM on this handset is 64MB, do you have a source of this information?